The VISD School Board approved shorter school days and new start and end times for the school day. 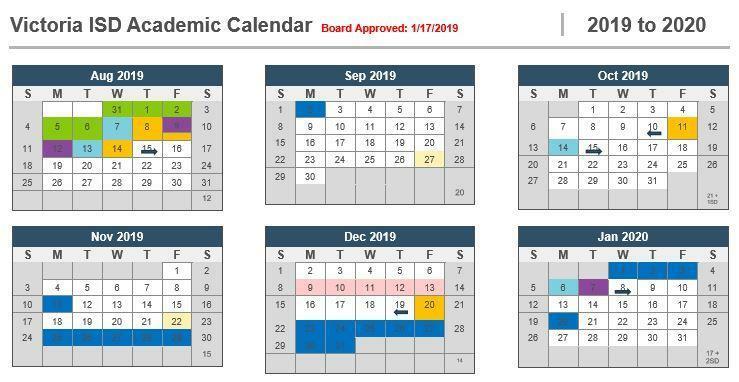 The Victoria ISD Board of Trustees approved the 2019-2020 academic calendar at its January 2019 regularly scheduled meeting. 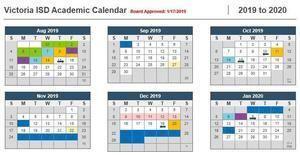 The calendar was developed through a collaborative process that supports students and staff. A Calendar Task Force, that included at least one representative from each campus, reviewed input from students, parents, faculty, and community when creating this calendar. One important change to note from previous years is a shorter school day and new start and end times for the school day. Elementary schools will now be in class from 8:00 am to 3:15 pm, middle school from 8:15 am to 3:30 pm, and high school from 7:45 am to 3:00 pm. Other changes include built in enrichment/remediation days to focus on unique needs of individual students and staff development waiver days that will count toward the required instructional minutes for the year.